"In 1811, Isaac Holden constructed a flour, corn and saw mill five miles downriver of Hillsborough (this site is just past the spot where you turn off the Holden Mill Trail). Nine years later upon his death, Isaac passes ownership of the mill to his son Thomas. Under Thomas Holden’s leadership, the mill operation grows to include an oil mill, threshing machines and a cotton gin. Holden’s Mill becomes the largest enterprise in the valley with 300 acres of land, multiple dwelling houses and a schoolhouse. It employs eight hands, a wagoner and miller. At some point before 1845, Thomas takes on a partner, his son-in-law John F. Lyon. Holden eventually moves his enterprises to Milton, NC and gives up ownership of the mill to Lyon in 1851. After financial difficulties, Lyon loses the mill in 1868. The mill reopens sometime after 1882 under the ownership of Samuel A. Cole and ceases operation after his death in 1893. 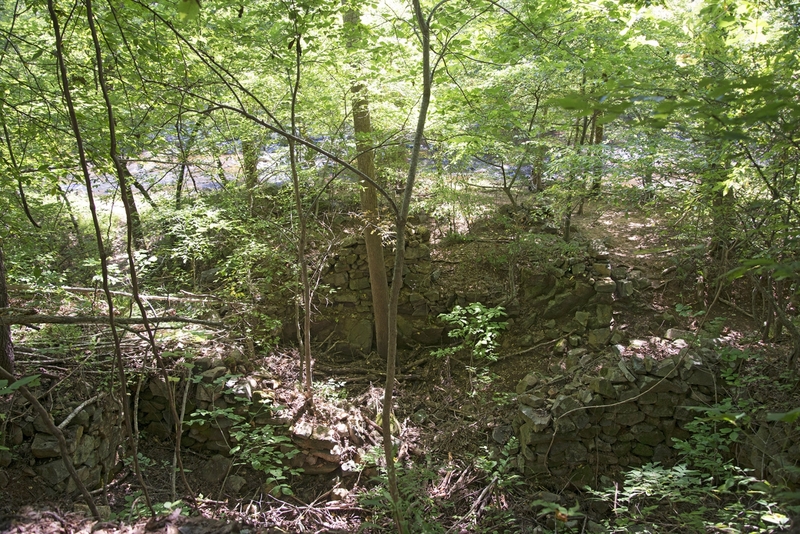 Much of the mill remnants are destroyed in the 1908 flood. Although the mill operation was significant and had a great impact on the local community, a more lasting connection exists between the mill and national politics. That connection is William Woods Holden, the illegitimate son of mill owner Thomas Holden and Priscilla Woods. Out of his lowly circumstance, W.W. Holden would go on to become famous in state politics, first as a newspaperman and later as governor of North Carolina. However, what makes him most notable is that he became the first governor in the United States to be impeached and removed from office."